1789b is an enigma of sorts. But I’m getting ahead of myself. Perhaps I should start from the beginning. I’m not new to bourbon, yet I’ll be completely honest and say that prior to this year I’d never heard of 1789b. Perhaps it’s because I don’t chase coveted Willett bottles or associate with the right folks, but for whatever reason, until recently, the name 1789b rang zero bells. So, one day I’m checking my email and waiting in my inbox is an inquiry from a Mr. Reid Bechtle. It was a kind and friendly email, so I replied and we started a nice exchange. Fast forward to today and I have three different Russell’s Reserve Single Barrels to sample – all selected by Bechtle and his fellow bourbon aficionado, Emerald Adair. Whatever 1789b is or is not, they officially have my attention. And now you may be wondering, what the hell is 1789b? Good question. Well, if you want the long answer I highly recommend visiting Bourbon Pursuit, as they interviewed Reid and Emerald last year. Most of your questions will be answered in that podcast (it’s a good one too), so there’s little use in me reciting it word for word. If you want the short answer, well 1789b is a private bourbon club and whiskey forum that gets its name from the year Elijah Craig “invented” aging whiskey in charred oak barrels (crafted from wood chopped by Paul Bunyan, of course). Oh, and the “b?” It stands for … wait for it … bourbon. Deep, right? Okay, so back to reality. 1789b has a lot going for it, yet at the same time that’s it. It has a lot going for it. Not for you, not for me, just members, of which there can be only 70. Period. And if you’re in the industry – work for a distillery, distributor, retailer, blog, write books, whatever – no soup for you! Members aren’t allowed to sell or trade bottles, so most stay strictly within the group. There are, however, some charity events in which bottles have been offered for sale. In fact, charity is an aspect of 1789b that I admire and appreciate, as they give a portion of their (internal) membership bottle purchases to no-kill animal shelters. Over $40,000 has been raised so far and that’s undoubtedly commendable. So one might ask why am I even bothering to review bottles that very few will ever have the chance to enjoy (other than the obvious fact that they’re Wild Turkey selections)? Well, that’s another good question. Here’s my answer. 1789b is well-regarded, at least based on my research. The opportunity to even taste these samples is arguably rare in itself, as I’m not a member (can’t be), and many distilleries reportedly respect the group highly. At the same time I can’t help but approach these samples with an extra dose of skepticism. With a group of what Mr. Bechtle describes as “ordinary nice guys,” that shuts out industry insiders and limits themselves to a very tight number (bound by tight rules), they make themselves arguably elite in the process. It’s enigmatic (at least from my perspective). But I’m not writing to examine 1789b as an organization; I’m writing to answer a single no-frills question: Are Wild Turkey barrels selected by 1789b special? In other words, are they a cut above “Average Joe, Everybody’s Welcome” whiskey club picks? Perhaps they are. Maybe they’re life-altering. Or, maybe they just taste like the majority of Russell’s Reserve Single Barrel private selections – always damn good, but not always outstanding. I could hypothesize all day but I think I’d rather have a few pours and find out the proper way. Overall: This is hands-down excellent bourbon whiskey, and honestly, about as good as modern Wild Turkey gets. It’s no Woodland Wine short barrel, nor is it entirely equal to 2018’s Master Distiller Selection, but “Reid & Emerald VI” is close enough to earn a borderline top-tier rating on my Turkey scale. In fact, I could easily see someone preferring R&E VI for its warm Autumn-esque profile – baked apples, oven-fresh pumpkin pie, falling leaves and cool breezy nights – a virtual spiced orchard laced with sweet herbs and citrus. Quite the lovely pour! Overall: I don’t think this barrel could’ve been named more appropriately. “Time for Turkey” is right on the mark. This pick, while similar in some ways to Reid & Emerald VI, is more representative of an everyday quality Russell’s Reserve Single Barrel private selection. 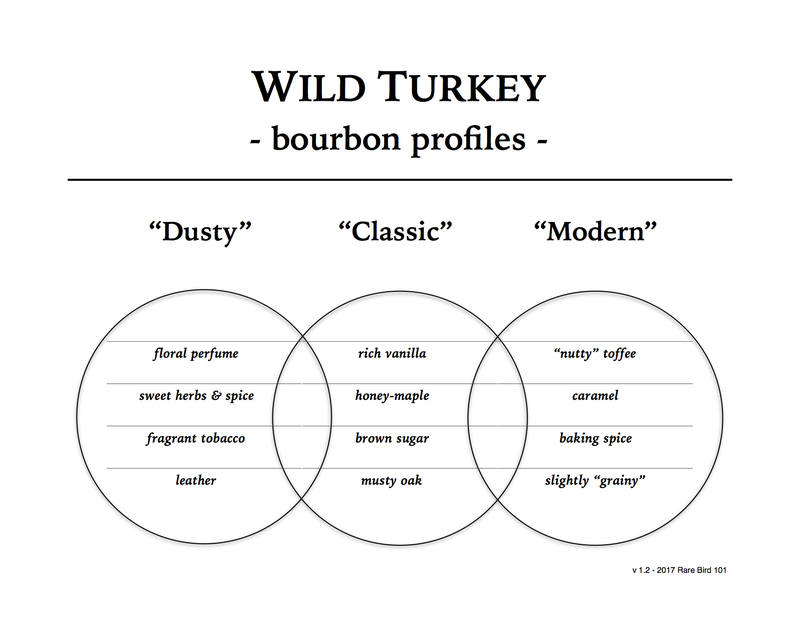 It’s unmistakably Wild Turkey – so much so that it fails to stand out as unique or noteworthy among several other barrels I’ve sipped. Don’t get me wrong – it’s a tasty pick and I’ve rated it accordingly. It just lacks that special something that other notable Russell’s Reserve private selections showcase. Overall: This selection might be called “Third Bird” but it certainly doesn’t fall into third place in today’s lineup. While I initially felt this barrel had striking similarities to Time for Turkey, the exemplary finish undeniably sets it apart. I’d even argue that Third Bird’s finish rivals that of Reid & Emerald VI. It has warmth, depth, and intensity, yet maintains balance and finesse throughout its full duration. All things considered, Third Bird is an excellent pour. A slight step above Time for Turkey, but not quite the stellar level of Reid & Emerald VI. In closing, I’d first like to thank Reid Bechtle for making this tasting possible. It was truly an honor and privilege to enjoy something so few have experienced. A very kind offer from a very kind gentleman. Thanks again, Reid. As for the three Russell’s Reserve Single Barrel selections, I think it’s obvious that Reid & Emerald VI is my personal favorite. While all three barrels display similar profiles (pretty damn consistent as a matter of fact), R&E VI just has that added bit of everything, particularly on the nose and palate. Sure, Third Bird has an incredible finish – possibly the best finish of the three – but it’s not enough to make up for its more typical (quality) Russell’s Reserve flavor. So what’s the takeaway from this tasting? Well, I think it’s important to stress that there’s no imposing reason for someone to chase 1789b Wild Turkey barrels. Are they excellent? Yes. Exceptional? At least one pick, for sure. But speaking truthfully, there’s no reason you couldn’t find private barrels of equivalent (or higher) quality. You’d have to shop around – take a gamble or two (or three). And maybe that’s 1789b’s primary appeal. With a group of dedicated bourbon enthusiasts so tightly knit and focused – a group that literally walks away from barrels on countless occasions – when a selection is finally made, it’s surely one worth savoring. I never heard of the club either. It seems a bit on the haughty side. On another note is the single barrel Russells being produced in smaller numbers? Last winter there was always a bottle or two here but I haven’t seen one for months. Connecticut, at least my part, is a pretty small boubon market though I think. George Dickel is bottled in Norwalk though these days! I wouldn’t call 1789b haughty, though I understand where you’re coming from. I kind of felt that way initially myself, but after watching Bourbon Pursuit and exchanging emails with Reid, I think they just have an agenda that other clubs don’t. Which is fine for them. Plenty of other clubs out there, that’s for sure! As for Russell’s Reserve SiB. I don’t think less is produced, I just think it’s more popular now. Have you talked with the manager of your local? Maybe there’s something going on in distribution to/in your state? Curious to know what you find out. Cheers! I’m going to ask at the store today. They’re quite friendly and helpful. Trying to see if they can get a bottle of the Jim Beam High Rye Harvest for me. Thanks again!!! Thanks for the advice! They said it’s getting hard to find but they’re saving me the next bottle of the Russells Reserve single barrell bourbon! Oh and I have a question I can’t find a answer to by googling. What does it mean when someone says a bourbon is ‘grassy’? Jim Beam gets that description. You’re very welcome. Glad you’re getting proper treatment! When I hear grassy, I think young and grainy. Thanks Reid. I greatly appreciate the opportunity. Should you ever find yourself at Wild Turkey picking more barrels, I’ll be right here waiting – happy to review again!